St John Vianney Roman Catholic Parish, Cheshire – Registered Charity 234025 – Incorporating St Wilfrid’s in Northwich, Our Lady of Fatima in Barnton and St. Bede’s in Weaverham. WELCOME to our Parish of St. John Vianney. 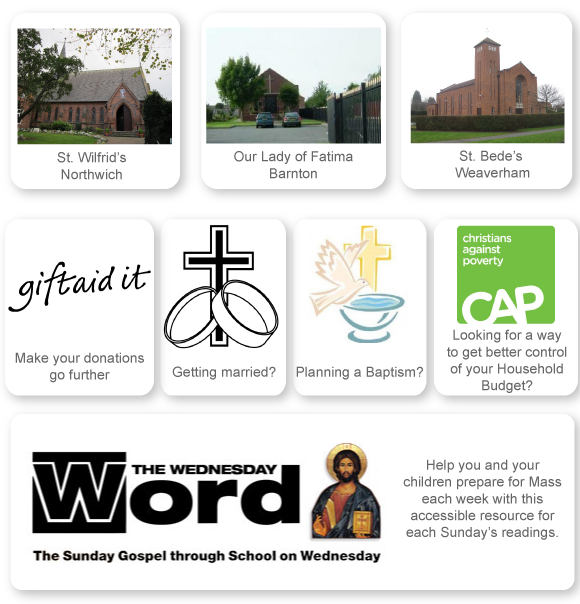 This is a relatively new Parish, established on Easter Sunday 2013, but it incorporates the three older Parishes of St Wilfrid’s, Northwich (established in 1830); St Bede’s, Weaverham (1950) and Our Lady of Fatima, Barnton (1953). We hope you find everything you need on this site, but if not, please get in touch. We hope to see you soon!